The monk name Magnus from the monastery of St. Galleon (Switzerland) with his assistant Theodore in the 8th century, going through cities and villages preached Christianity and expelled demons. 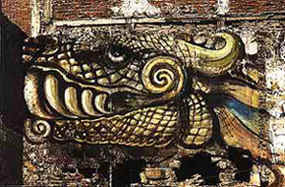 They came to Kempten, where people suffered from different sorts of dragons and snakes. Magnus with the help of God killed the leader, after that evil spirits left this place. 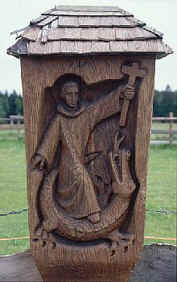 In England, in the place near Cappadocia the knight George slaughted a dragon and the church announced him as an saint. The Bible mentions dragons in Ps. 91:13, Job 40,41 and in Revelation. In all legends about dragons you can notice, that actually, not mentioning their appearance, there were 3 kinds of dragons: the majority of them just annoyed people, stealing poultry, killing cows and terrorizing neighbohoods. These dragons were just representatives of fauna of that time, like an existing giant lizard –monitor Komodo-dragon which resemble dragons in appearance and can chew animals' hoofs with his strong chaws. The second group of dragons are those who carried out certain functions, not typical for animals, for example: guarded treasures and were vulnerable to prays of righteous men. And the third, the rarest are the dragons which could change the shape, create miracles and not only speak, but even give wise advices. As you see, the familiar demon Pazuzu belongs to the third category of dragons. The Bible calls him the “king over all the children of pride”. To the second group either beings created by Satan by genetic experiments, or controlled by him demoniacally (may be - Naga) belong. As an experienced criminal the Satan, trying to hide the traces of his blood mixing crimes in the countries, where Christianity was by poured out all these pseudo-dragons of the first and second groups for disorientation of people what the real dragons are – the hellish crew, servants of the Satan. The Bible poured light on their nature, and people could already understand that sexual relations with dragons are not honor but a great sin. He let them out, them who aspired neither to marriage, nor to connection with people to make the idea of blood mixing with dragons absurd for people and still continue his genetic experiments not openly as was earlier but now secretly under the mask of these categories. Therefore there are so many myths about the dragons of the first and second groups in Scandinavia - native land of Vikings, and in Western Europe, where royal dynasties were from time to time fed by new portions of real devil's seed. Dragons of first two categories were mortal, and the knights successfully won them. But Kashchey was Immortal. As you remember, in the fairy tale Ivan Tsarevich wins him, but most likely the fairy tale received its optimistic ending later, imitating the majority of triumphant stories above dragons. In the fairy tale nothing is said about the dragon's dead body. It disappears. Nobody in legends could boast of finding the dragon's skeleton. Pazuzu is immortal. He disappeared to appear again in the new physical body in other place and in other time.